I was thinking the other day how there are a lot of things that I don’t know. For example, I don’t know why the staff at Chipotle constantly puts cilantro in my burrito despite how much I tell them I don’t want it (though from the looks of it, that place has got a whole other set of problems). I don’t know why $50 shampoo is better than the generic stuff I get at Walgreens because it works just fine despite what my sisters tell me, seeing as how my hair has yet to fall off or cause me to contract cancer. I also don’t know why I occasionally see a squiggly line in my eye fluid. The list goes on and on, and continuing it any further in this post will do nothing but increase my already growing depression. Anyway, the reason why I was thinking about my intellectual inadequacies is because sometimes you just see a news story and realize how much there is to know in this world and also how little of it that you actually know. For instance, is there any reason why regular people like you and me can’t keep chickens as pets? Because apparently there’s a movement in Ann Arbor, MI to get the city to pass an ordinance that would allow its residents to keep chickens as pets. Really, is this an issue? I had no idea there was even a problem with doing this, let alone that it was illegal. 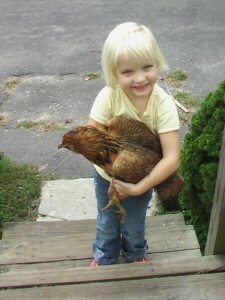 I remember when I was a wee lad my neighbor had a couple of chickens in his backyard. He’d feed them corn, harvest their eggs, and occasionally even allow them to berth a couple of chicks. This all wouldn’t be so strange except that I grew up in a major urban California city. Though I never thought twice about it when I was a kid, I just thought my neighbor really liked fresh organic eggs and playing farmer. Coincidentally, the organic food movement is what Stephen Kunselman, the Ann Arbor councilman spearheading the move to pass the ordinance, is using as the basis to promote chickens as pets. Supposedly, fresh eggs are a lot tastier and healthier for you than what you get at the supermarket. Sounds great right? Except that a lot of residents and the local Ann Arbor government are clucking (HA, I’m so witty) about the health and safety issues that come with owning chickens. Apparently there’s a concern that allowing people to keep chickens as pets will encourage or at least not help to stem the spread of avian bird flu – which I hear is pretty nasty. There’s also the issue of noise disturbance – less we forget what it is roosters are known for besides providing hours of entertainment (I’m joking, please no letters). Anyway, all this got me thinking about chicken laws in other cities, specifically what’s the penalty for owning chickens? Well, it ranges from fines to a misdemeanor depending on the circumstances (e.g. number of chickens, sanitation issues, etc.). For those of you interested in keeping a chicken(s) as a pet(s), I strongly suggest you check your local laws to find out whether it’s legal. The internet is an amazing place, by the way, so be sure to use it.